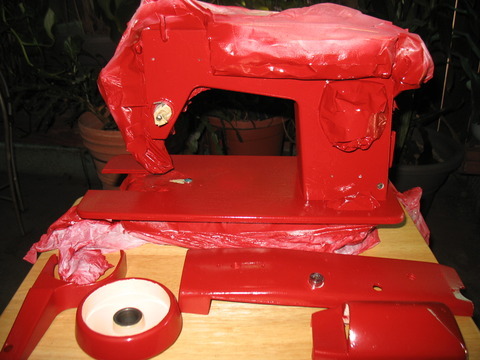 So you want to re-paint an old sewing machine do you? Some of you e-mailed me wanting more detailed information on how to do this so here we go. 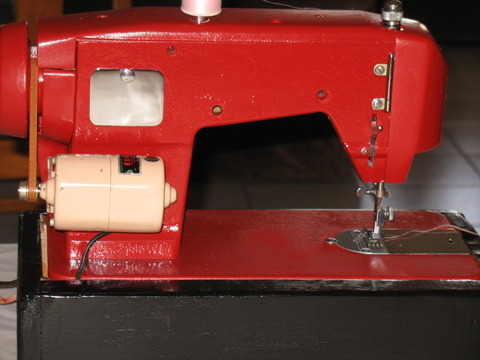 I am sure there are many other ways and products to use when re-painting an old sewing machine but here is how I painted one of mine and the products I used. The machine is a vintage Edison Zig Zag sewing machine; not a great looking machine. It took me about two weeks from start to finish working on it few hours everyday. 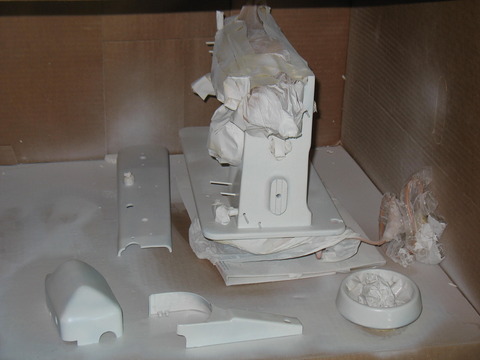 It was hard and tedious because I had to take a lot of the machine apart and strip the paint off of it and its parts. I did not do anything to the bottom of the machine so some of the old color is still there but not visible when the machine is on its base. I used masking tape and plastic to cover most of the machine. I also used pieces of toothpicks and q-tips inserted into the various holes throughout the body of the machine to prevent paint from getting in there. 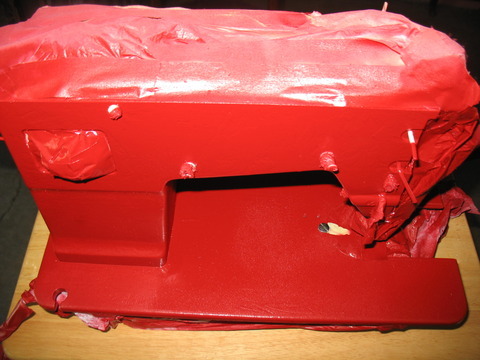 I used Jasco brand paint & epoxy remover and a stripping tool to strip it, then I sprayed it with primer (for metal), then I re-painted the machine with Rust-Oleum Painter’s Touch Ultra Cover 2x Coverage spray paint in Colonial Red. (Warning: stripping paint can expose one to lead.) I made sure to do this outside in a well ventilated area using goggles, a face mask and gloves. I also used a large box to spray in to prevent paint from flying all over my patio. The knobs and other items I was unable to remove, were either covered with plastic or a piece of paper towel then wrapped with masking tape or just covered with tape, you can also use painter’s tape. 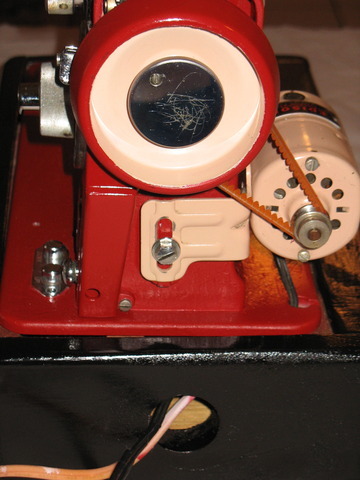 The tape was wrapped from behind the knob towards the front of it to create a sort of bubble. 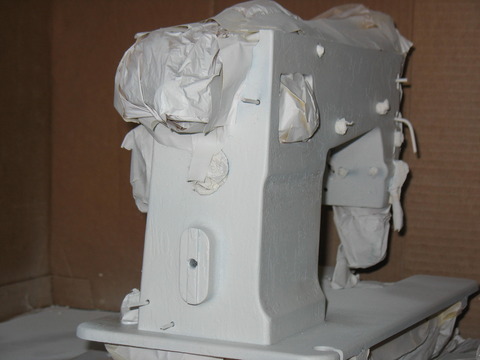 If you notice on the photos where the machine has been sprayed with primer and/or sprayed with paint (but not finished), the machine appears to be puffy on top and other areas and that is because I filled the inside of the machine with paper towels. I did this in case there was any paint seepage when spraying the machine. I ensured that the knob areas on the inside had extra paper towel pieces there too. In order to get a smooth, non-drippy paint finish you need to thoroughly remove all existing paint including the original primer coat on the machine (see photo for blue primer on my machine). 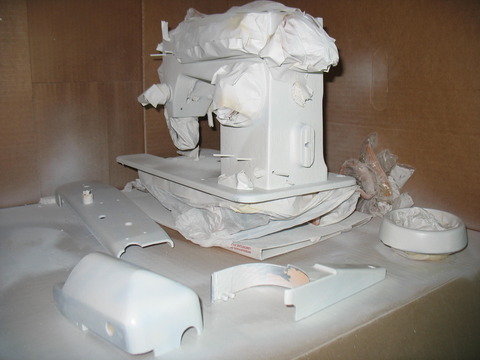 In addition, one needs to be patient and let each coat of primer and paint dry. I pretty much followed the instructions on the cans regarding how to spray and the number of coats. I decided to use the paint and epoxy remover gel on the machine because sanding it off (as noted on the spray cans) would have taken longer, in my opinion. I did sand off the final patches of stubborn primer and paint. Once the machine and its pieces were stripped, I cleaned all with a slightly damp sponge and then dried every piece thoroughly with a towel and let it all sit outside and air dry overnight. 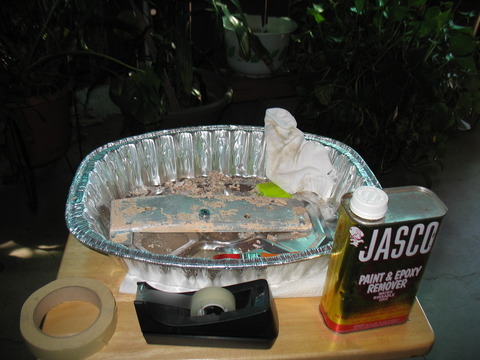 The materials probably cost me $35 or less for the epoxy, primer spray (1 can), spray paint (1 can) and stripping tool. Sending my machine out for re-painting was not an option because I have read it is really expensive (above $500) AND I was unsure if I would keep this machine. Although my paint job is not perfect I am pretty happy with the results. This machine found a new home recently but I definitely want to paint another! PLEASE NOTE – THIS PROCESS HAS BEEN SUCCESSFUL FOR ME SEVERAL TIMES HOWEVER, RESULTS MAY VARY. USE THIS TUTORIAL AT YOUR OWN RISK. 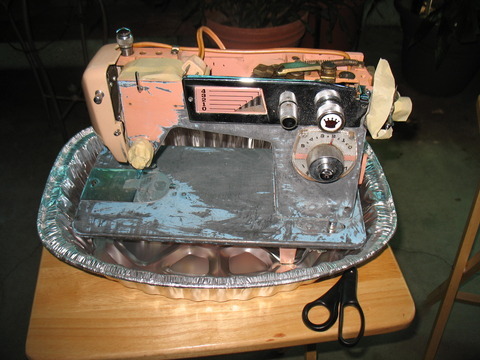 In an earlier post I showed you how to oil a vintage sewing machine, and I briefly mention “frozen feed dogs”. 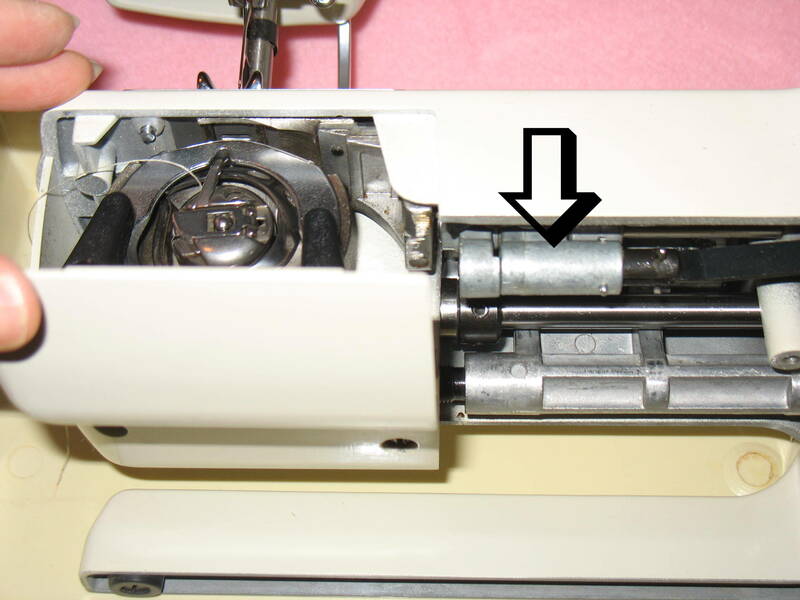 If your vintage sewing machine has a “frozen feed dogs” lever, meaning you are unable to drop or raise the feed dogs with the feed dog control lever, then this is the post you need to read to fix them. 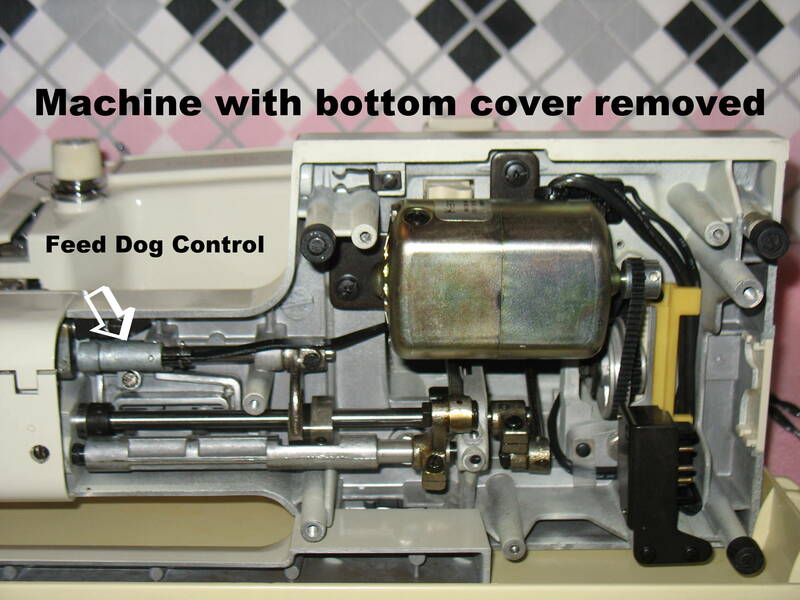 Your sewing machine may have its feed dogs frozen on the up position and sewing properly but you should also be able to lower the feed dogs to darn, draw, and to make it easier to remove a piece of fabric that may have gotten chewed up by your machine. Any machine that sits around for any length of time can seize up due to the oil drying out. The freezing of the feed dogs is a sad thing. 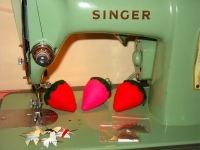 It means that the poor sewing machine has never been used or has had very little use. Why do people do this? 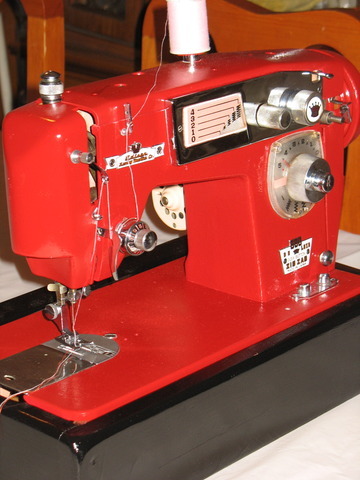 Sewing machines need to be used. And oiled, and believe it or not, they should also NOT be stored on the floor (even if they are in their case). 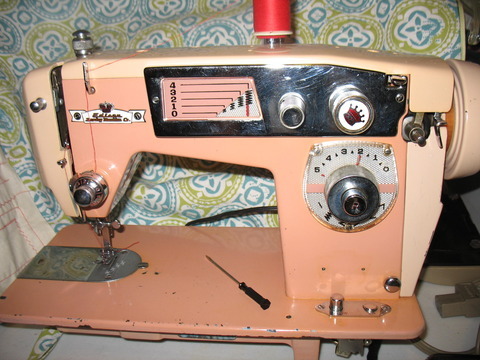 Try to store your sewing machine off the ground, preferably on a table or shelf. 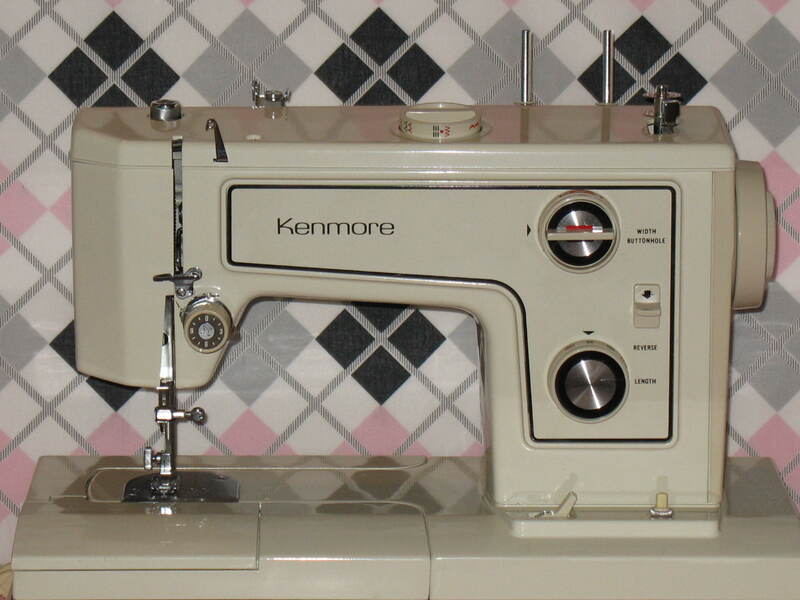 We will be looking at a Kenmore 1560 Free-Arm Zig Zag Sewing Machine for this tutorial. 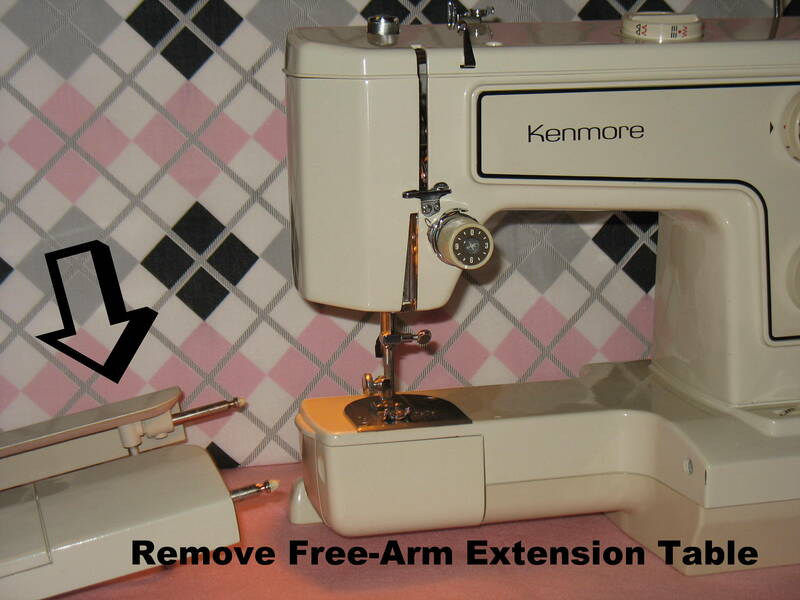 Since this is a free arm machine, you need to remove the extension table. This is what the bottom of the machine looks like with the extension table attached. 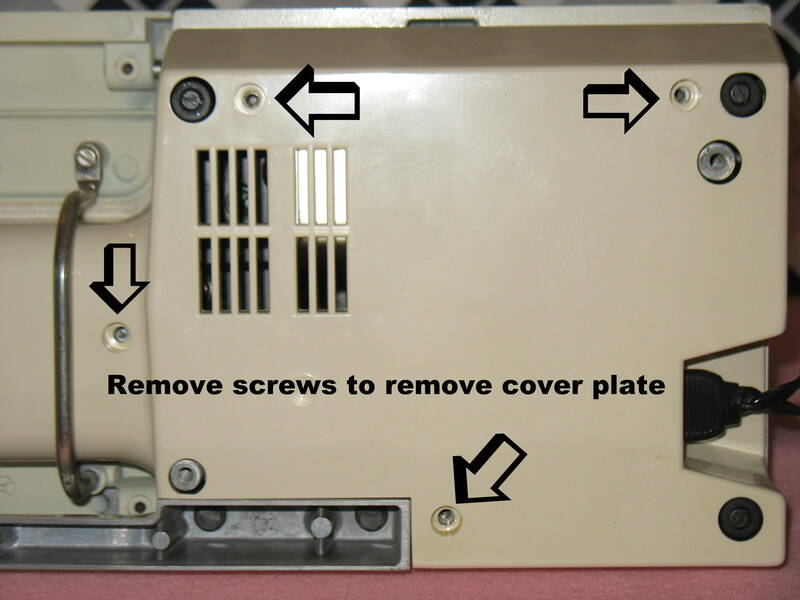 Next, if your sewing machine has an underside cover plate, you need to remove it by removing the screws holding it in place. Do not forget to unplug your machine. 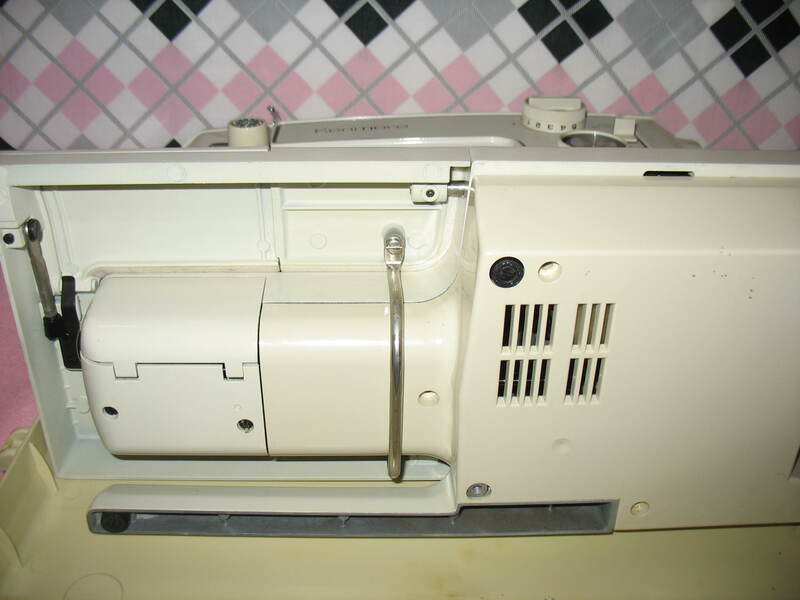 Here is the underside of the sewing machine after the cover plate is removed. You need to find the feed dog control mechanism on your machine, the location of it for most machines is pretty standard. 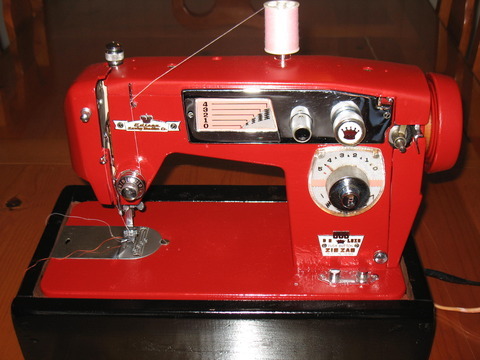 You should find it somewhere near the bobbin area and it is usually shaped like a bullet on vintage sewing machines. For this tutorial I am going to call it the bullet and the piece encasing it, the bullet case. 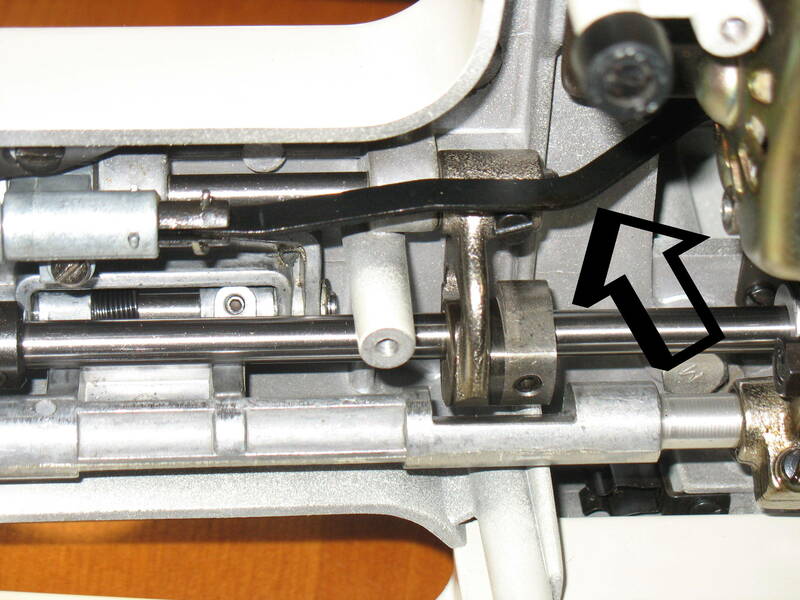 Notice on the next picture how close the feed dog controller is to the bobbin area? Depending on how stiff this part is, you need to have some patience and do it a little at a time. Applying heat is the key! 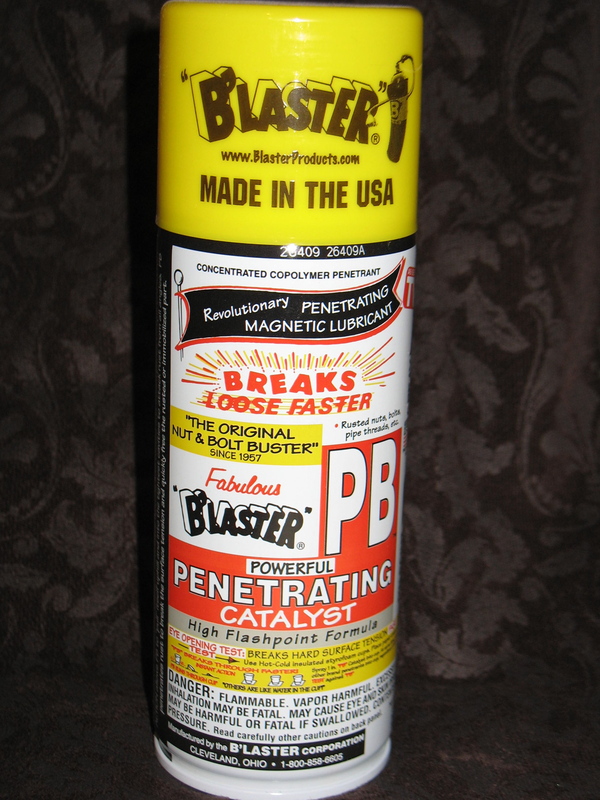 Get the PB Blaster and spray a little bit or Tri-Flow (******sewing machine oil should be used only as a last resort and only a drop at a time*****) and add it to the 2 areas that the black arrows are pointing to. Start with just a bit (1 drop) making sure it seeps into the crevice and on the end of the bullet like part. 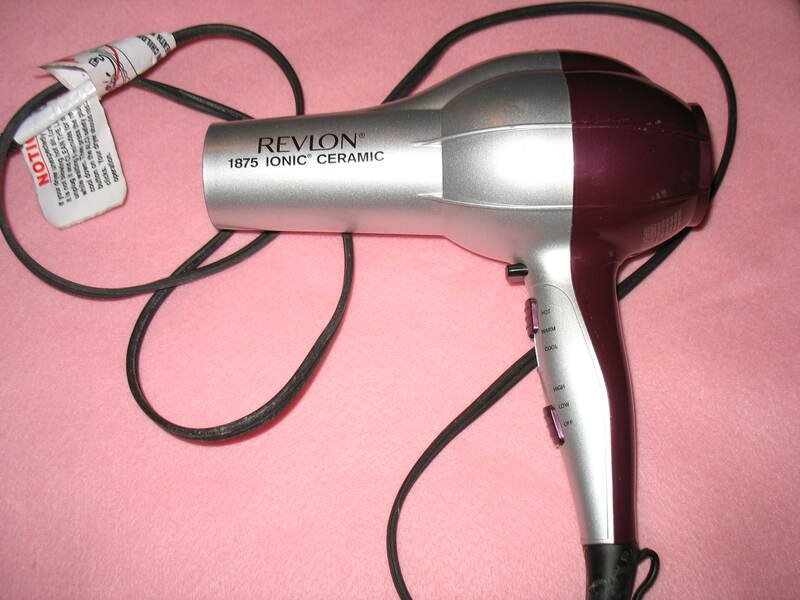 Plug in your hair dryer, set it on HOT and heat the entire bullet casing moving the hairdryer from one end of the piece to the other. Make sure to heat it well (caution it can get really hot). 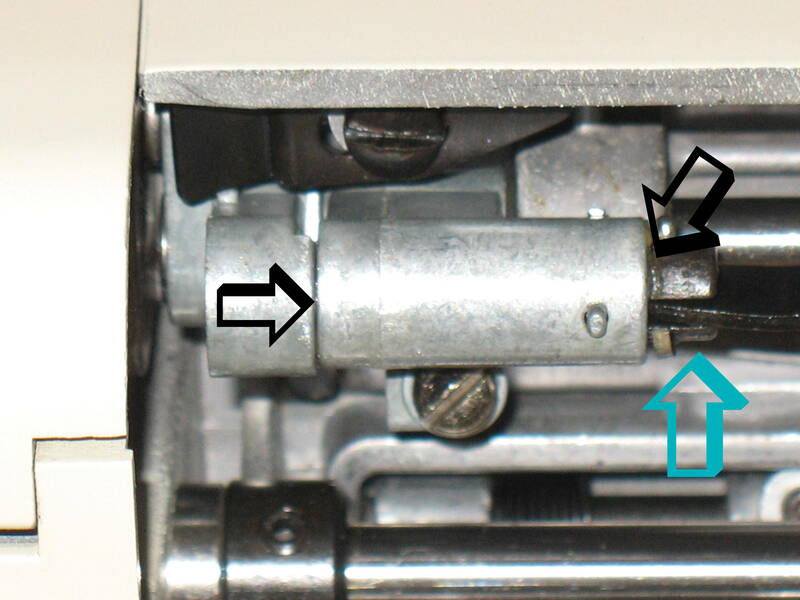 The BLUE arrow is pointing to the long piece of metal that is attached to the bullet piece. and raise the feed dogs. You will need to wrap and hold the elbow with a few paper towels or a rag. If using paper towels, try to make it a bit thick. What you are trying to do here is to wrap that piece because you will be tapping it with the hammer, you should not hit it directly with the hammer. 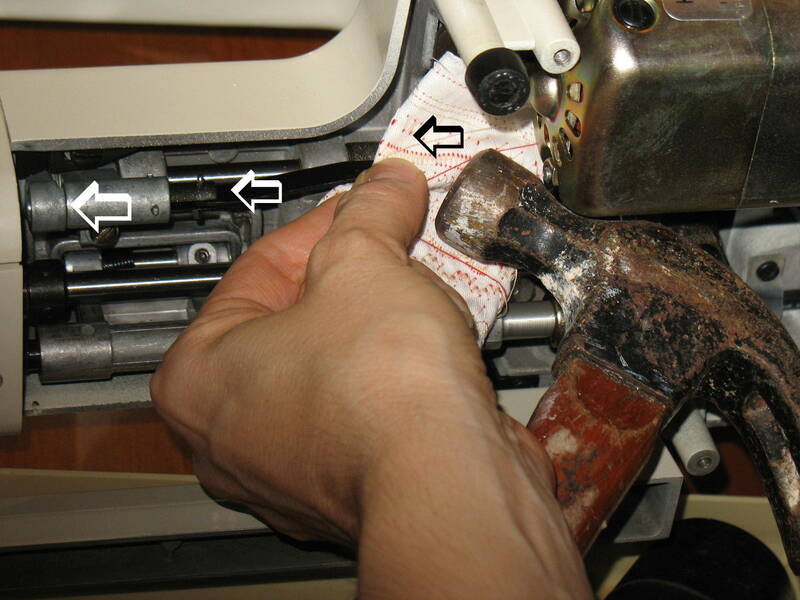 Now, get your hammer and lightly tap the “wrapped” elbow section in the direction of the bobbin area (see arrows). Try to lower/raise the feed dogs with the feed dog lever on the machine. If you are unable to move the lever, repeat the steps above, this will work. I have loosened many feed dogs this way, it just takes a little patience. 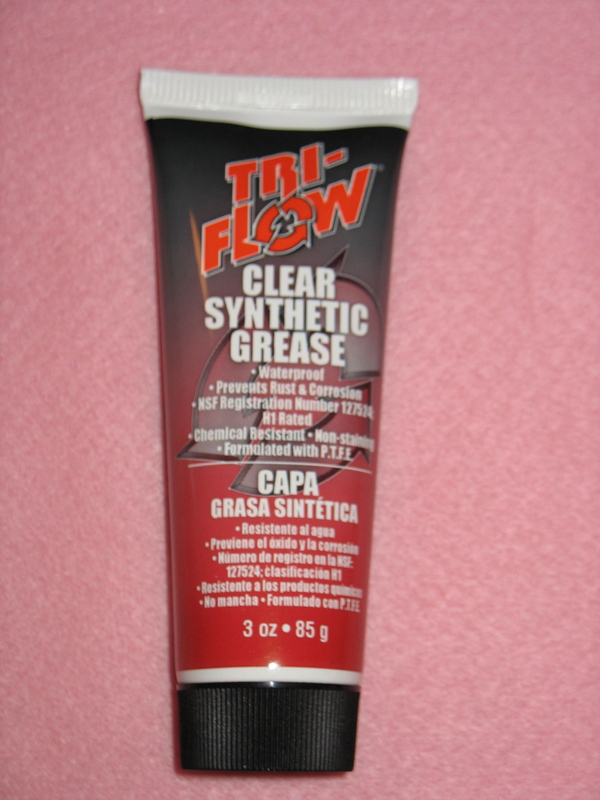 Once you have loosened the bullet and it moves freely when you drop or raise the feed dogs lever, add some grease (Tri-Flow) to it as this part needs to be lubricated to continue to work properly. That’s it! Easy right? If not contact me.